A friend recommended I listen to Room a few weeks ago when I asked for audio recs on Twitter. I'm really glad that it was available at my digital library. I'm not sure what it would have been like to have read it myself, but listening to it made it a great story. It is told from a 5-year-old's perspective. It is an adult book so this a new twist for me and I'm not sure if I would have been able to fully capture a 5-year-old's voice in my head like I was able to with the audio version. Once I downloaded the book and started listening to it, I could not stop. It was an emotional story that really drew me in. It seems that we have been hearing more and more about kidnap victims being found years after their abduction. I'm always curious as to what life is like for them after their release, but rightfully so the news media does not continue to follow the story. They deserve their privacy so I'm glad that there is a fictional story that sheds light on what life might be like after captivity. I was participating in a LitChat discussion on Twitter on Wednesday where they were discussing Room. One of the questions was if we liked in the room or outside the room better. I liked outside the room. While it was important to establish what life was like in room, I found myself a bit bored and anxiously waiting for them to get out. I wasn't sure how they were found/released, but you know a little from the summary that they are eventually released. In the discussion on Wednesday, another aspect we chatted about was how Ma kept the fact that outside was real from Jack. He grew up believing that there was nothing beyond the 4 walls of room. I think Ma did the best she could with what she had. It would have been difficult for her to explain many things to him without him ever having concrete, physical knowledge of it. Also, it would have probably made her life even more difficult. You can tell she was often just barely hanging on. And, from how many questions Jack has (just like any 5 year old does when they discover something new) once they are outside you can tell she would not have been emotionally or mentally able to deal with his natural curiosity. It was best for both their sanities that his world be limited to room. Another blogger I follow recently did a review of Room. In her review, she mentioned how Emma Donoghue slipped in her view of abortion. I remember the line and when I heard it said I thought it was just kind of odd and didn't really make sense why it was even said. So I'm glad to see that I wasn't the only one to pick up on it. It seems to be becoming popular for audio books to have more than one narrator. Sometimes I think it is needed. In Water for Elephants , I thought having an older and younger Jacob was good. The Girl with the Dragon Tattoo may have been easier for me to follow had there been more narrators. At times, though it seemed odd in Room to have more than one narrator. It wasn't as noticeable when they were outside, but inside Ma didn't speak a lot and so you would have a lot of Jack with the occasional short sentence from Ma. It seemed to jolt me every time. But overall, I think it was good having more than 1 narrator, especially if you can't find a narrator that can do a variety of voices. Do you prefer there to be 1 narrator or multiple narrators? If you haven't given audio books a try this is a good one to start with. It was a great story, that I think almost any one would enjoy. Since it is told by the 5-year-old Jack, it is a clean read. Jack is highly observant, but because of his age glosses over things he does not understand. 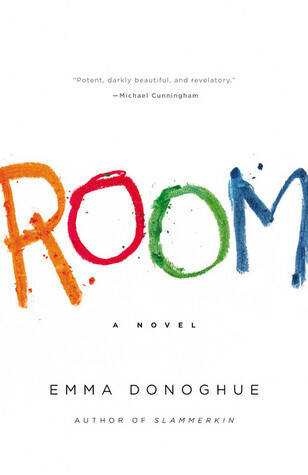 Want to know what others thought about Room by Emma Donoghue? Check out GoodReads.com, The Parchment Girl, Always with a Book. I felt the same way you did about being anxious for them to leave Room. It felt cramped just reading about it! I added your review to my list; thanks for linking to mine! Great review! I'm a little bit confused about why they would have two narrators for Jack, as I feel that not much time passes between Room and Outside, but I might be remembering incorrectly. I do wonder if it's more or less terrifying in audiobook form. Donoghue's prose is so immediate I wonder if it doesn't put a barrier between the reader and the text. Glad you liked it thought! I haven't ever experienced an audio book and I'm not sure whether I would enjoy it. That said, I'm fascinated by the storyline of Room. I guess the narrator would be someone young and talented enough to convey the voice of a five-year old.